It is clearly documented that children with Down syndrome have a compromised immune system and slower metabolism. Test results also show many kids have compromised detoxification function. By serving organic food to your child, you support their overall health and development. Instead of using energy to detoxify pesticides, your child can use that energy to learn and grow. 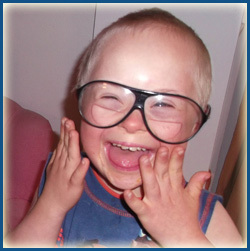 Discerning how to spend limited funds is always a difficult task, regardless if your family has a special needs child or not. When my child was very young and prone to being sick, we bought as much organic produce as we could afford. As she got older and healthier, we used the “dirty dozen and clean 15” list provided by the Environmental Working Group to help discern what foods to purchase. http://www.ewg.org/foodnews/summary/ It is recommended that you wash all your fruits and vegetables with white vinegar and water. Because animals used to produce non-organic meats, eggs and milk are given antibiotics and hormones, we buy these organic. I found an organic farm within driving distance and purchase in bulk to keep costs reasonable. Our organic ground beef costs the same as non-sale ground beef bought in stores. Pressed for time? Ask a friend, neighbor or relative to investigate organic farms and compare costs for you. Great produce can be found at many farmer markets and through CSAs. “Eat Local” initiatives are working to bring higher quality produce to families around the country and often at better prices than you find in the grocery stores. Ask around. Network. A man who knew my uncle planted my daughter her own field of organic broccoli one year. That still touches my heart.